Thanks to Frances Pauli for being such a good sport in yesterday’s fun interview! 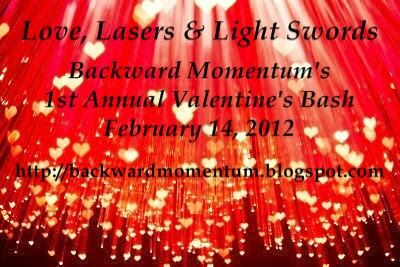 I got to participate in Backward Momentum‘s 1st Annual Valentine’s Day Bash “Love, Lasers & Light Swords” with a post on SF redefining long distance relationships. All contributors were asked to take part in a giveaway and I did my part by offering a $15 gift certificate to Amazon.com. Congratulations Barbara, look for your e-gift card to come in your inbox later today! Thank you and congratulations to all the other winners who took part in Backward Momentum’s bash! It’s too late to enter to win, but there are some great posts there by some wonderful writers and, who knows? You may find a new favorite author!